Graduating from college today for many means taking student loan debt along with them. Although it may seem like the debt will follow you for years to come, there are a few ways to try and get your debt under control and pay it off more quickly. Below are 5 tips on how you can lower your student loan debt at a faster rate. 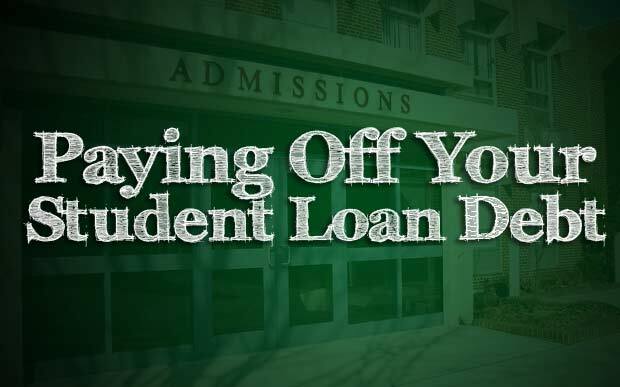 Your student loan functions in much of the same way as credit cards and mortgages do. You have your minimum monthly payment amount which is the principal along with the interest amount due. Your lender of course hopes you only that minimum amount. The longer you take to pay off your loan, the more interest accrues and the more money the lender makes. One of the best ways to get your student loan paid off faster is to make extra payments. There are no prepayment penalties so this is a no-brainer. It may take some budgeting on your end to come up with the extra money, but it's definitely worth it. If you get a raise at work, consider putting that extra income towards your loan debt. You can also schedule an automatic payment for every 3 months, for example. The key takeaway is to make an extra payment any time you can. Once you come up with a plan, call up your lender and let them know you will be looking to make extra payments on your loan throughout the year. Just be sure that they apply the extra payment to the principal only and not to next month’s payment. Doing this will help limit the amount of interest you accumulate. Refinancing your student loans can also be a great strategy for bringing down your student loan rate. There are many private student loan lenders that offer low interest rates in the 2%-3% range. This is much lower than what you will see with government loans or school backed private loans. You have the option to choose between both fixed and variable rates along with loan terms ranging from 5 to 20 years. Some lenders offer what are called hybrid loans that feature both. In order to boost your chances of being approved for student loan refinancing, apply to multiple lenders all at once. If you are employed as a teacher or in some other public servant position, there exists student loan forgiveness programs that will right off a portion or the entirety of your student loans. In order to qualify, you must be a full-time teacher with at least 5 years of teaching experience in a designated elementary or secondary school that caters to lower income families. Teachers with federal direct loans or Stafford Loans, can get a reduction in your student loans of up to$5,000. Elementary or secondary special education teachers in math or science, can receive up to $17,500 in forgiveness debt. If you are are employed full time with an eligible state, local or federal public service job or 501 non-profit job and you have made at least 120 on-time payments, you can be eligible for the Public Service Loan Forgiveness program. If approved, you can have 100% of your student loans forgiven. This is where a monthly budget is a must have. Your goal is to be able to pay all your bills with just your base salary. Any additional income from raises, bonuses or tax refunds, should be put aside for your student loan debt. You may be tempted to spend that extra money on a vacation or something else, but don't. These extra payments will help you save on interest and will also considerably reduce your loan balance. Financial freedom will be that much closer. Once you are done paying off one loan, automatically shift that payment to your next loan. Adding just $50 bucks a month can really reduce the time it will take for you to pay it off, especially since it will be going directly towards the principal balance. Also consider using an amortization table. It will be able to narrow down the exact date you can expect to be debt free and how every extra payment you make could subtract an entire month from your debt calendar. Paying down any debt takes sacrifice. You will certainly have to pass on things like vacations or that new dress, but the key takeaway is that it is all just temporary. Once your loans are paid off, you will be free to start saving for the things you really care about like your first home, retirement, travel etc. Some sacrificing now leads to less sacrificing later.